You may have heard whispers of a voice search revolution. Perhaps you’ve dismissed it as a passing trend that won’t live up to the hype. Maybe you simply believe voice marketing isn’t for you. Your business doesn’t need it, and your audience doesn’t want it. 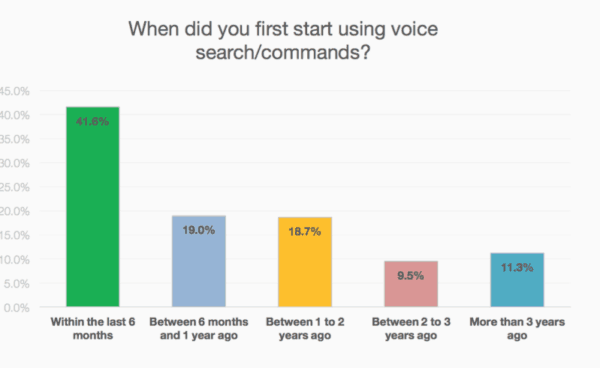 Well, all the evidence suggests that voice search is much more than a fad or passing trend. Google research shows that 20% of all search queries on mobile are voice search, and more than 40% of adults use voice search daily. Voice search is not going to be “the next big thing” for marketers to think about. It’s time for more businesses to wake up and realize that voice search marketing can work for them. It may have its challenges, but there are also plenty of opportunities. In this article. we’ll explore all this, showing you how to conquer the challenges, and how to make the most of the opportunities. Voice search, also known as voice-enabled, is speech recognition technology on smart devices, which enables users to perform online searches by speaking terms aloud instead of typing into a search field. The buzz around this has gathered a lot of steam in the last five years or so, but the market leaders have been around for longer than that. Siri – Acquired by Apple in 2011, the former standalone iOS app is now one of the top virtual assistants. Alexa – Amazon’s Alexa was released in 2014, initially as part of the Amazon Echo smart speaker. By January 2019, Amazon had sold over 100 million Alexa-enabled devices. Google Assistant – Not to be outshone, Google joined the fray in 2016, and Google Assistant is arguably now the best voice-enabled virtual assistant. What impact does voice search have on search engine optimization (SEO)? According to Pew Global Research, over 80% of Americans own a smartphone. A similar figure is evident across other developed economies including Canada, UK, Germany, South Korea, and Australia. Considering most smartphones have voice search functions, this means billions of people could potentially be using services like Siri and Alexa on a daily basis. For marketers, that’s an incredible opportunity, and also an important challenge they must embrace – sooner rather than later. 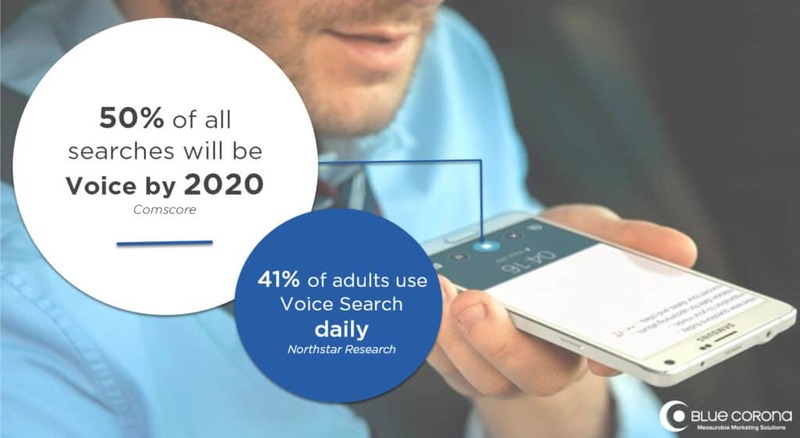 Gartner expects many brands will redesign their websites in the next few years to support voice search, as it is expected to deliver a 30% boost to e-commerce revenue. If your business is going to keep people engaged in this new era, you must understand how search marketing will evolve. The term ‘voice search revolution’ sounds a little dramatic. You may wonder if it really is going to have the impact that many people expect. Will keywords still matter? Is content marketing pointless now? The early signs certainly indicate there will be some seismic shifts in the dynamics of search marketing in the years ahead. People tend to speak in full sentences with voice search, and the artificial intelligence (AI) platform will respond in kind. As programs like Alexa use the text of web pages to deliver answers, content needs to be optimized for conversational language. Therefore, it must offer clear, cohesive answers to specific questions, and everything must be grammatically correct and logically formatted so the AI can decipher the information. Long-tail keywords have been around for a while. With the dawn of voice search, people tend to use even longer, more specific queries. Mobile-friendly websites have been a top priority for companies for a few years now, especially since Google’s move to mobile-first indexing. With more people using voice search, which usually happens on a smartphone, the push for a better mobile experience has increased. In many cases, voice searches are performed whenever people are looking for quick answers and information about the local area. They pull out their device and ask Siri or Google for directions or information on the nearest restaurant, bar, or shop. As leading assistants are integrated with Google Maps, businesses can use voice search marketing to increase their local search presence. This combination of voice search marketing and location technology allows people to perform more accurate searches, triggering a massive 900% surge in “near me” voice searches in the past two years. Featured Snippets are ever-more popular, with more businesses seeking to find ways to get their website into those coveted answer boxes above the organic search results. Features like these have crushed organic click traffic by almost 40%, which is a tough break for content creators. For users, however, it’s much more convenient – they no longer need to visit a website to get the answer they want. Instead, a quick voice search serves up the answer, which can be read back to you in mere seconds. The impact on SEO is undeniable. But does that really make voice search marketing essential? Do you really need to incorporate it in your marketing strategy to remain competitive? Rather than give you a simple yes or no answer, let’s take a look at five good reasons to use voice search marketing. After that, we’re sure you’ll be ready to make up your own mind. Text-based search is still the dominant force…for now. Whether or not it will stay that way isn’t something anyone can say with real certainty. 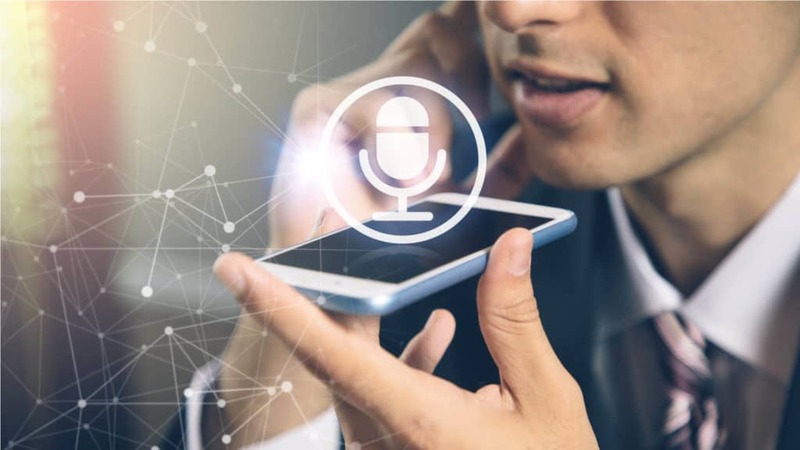 A report from eConsultancy highlights the widespread belief among the digital marketing sphere, which asserts that by the year 2020, at least 50% of all user searches will be voice commands. That’s a grandiose prediction, but one that is fully within the realms of possibility. By the end of 2018, there were reportedly over one billion voice-enabled devices currently in use. The more people use these devices for voice search, the bigger the market will become as more devices and more advanced technology push the boundaries. We can already see marked improvements, as Google Assistant improved the accuracy of its word recognition to 95%, which makes the technology more accessible and enjoyable for people to use. Voice search is going nowhere, and those who refuse to accept that may be left behind the innovators in their market space. If you have optimized your website content for long-tail phrases, you will attract more qualified traffic. Google will display your websites to users who match these very specific queries, so there’s a good chance that those users will be interested in what you’re offering. As people opt for more detailed, grammatically correct questions and terms with voice searches, there is much stronger intent on display. Marketers can leverage this by creating content that is optimized for specific questions, helping them identify people who are ready to purchase, and ultimately guide them to conversion with more relevant content. This is one of the biggest benefits of voice search marketing, as it can improve your conversion rates massively due to the influx of targeted traffic. One of the main benefits of voice search for users is the speed in which it generates results. Let’s imagine you have your hands full, driving a car through a busy town or feeding your cranky baby. If your company is the one that serves up these fast results, you can curry favor with prospects, encouraging them to choose your brand above others. As we’ve mentioned, local SEO is a big benefactor of voice search marketing, with more than 1 in 5 voice search queries seeking location-specific information. If you can optimize your content to cater to a local market who use voice-enabled devices, your business can really go next level. Yes, remaining agile and relevant is crucial in the digital age, but that’s not all. A killer voice search strategy won’t just make your brand look trendy and tech-savvy – it will improve the user experience. And that is what really matters nowadays. People respect brands that offer personalized, enjoyable experiences that are tailored to their needs and interests. That concept goes beyond products and content to the actual user interface and interactions they have with a brand. Google Assistant and Alexa are able to differentiate between different voices, making it possible for them to personalize their responses. As your interactions with brands begin to flow naturally, you can forge stronger relationships with companies. This is a boon for companies when it comes to improving customer retention and brand loyalty. Alright. By now you can see that voice search marketing is a pretty huge deal. It’s here to stay, and it’s going to shake things up in a big way in the years ahead. There’s a lot to be gained by getting involved, and when it’s done right, your brand and your customers will feel the benefits of voice search. We think it’s time you learned just how to start voice search marketing. After all, why should everyone else have all the fun? If you already have content on your web pages, it may seem like a gargantuan task to have to revamp it for voice searches. But it’s doable, and as you now know, it’s worth the effort. Here’s how to optimize your website for voice search. Try using Answer the Public to help brainstorm a list of questions your target audience may be using when searching for products and services that you offer. When you are brainstorming these types of questions for your market, you can organize them into various categories that correlate to specific steps in the customer journey. This will guide your content creation, and it makes your website content available through voice search to people at every stage of the buying process. A big difference between text search and voice search results is that the latter tends to return just one answer to the user query, whereas text search has a long list of links to choose from. For example, the beauty brand Esteé Lauder have a voice assistant Liv,” who is a skincare expert ready to deal with the many problems people may have about beauty routines. While a traditional text-based search would pave the way for you to scour multiple websites in the quest for the wisdom you need, Liv gives people a single answer. She also has a habit of recommending Esteé Lauder products in her responses. How’s that for clever marketing? Because of this difference in search results, voice search optimization can be a tricky concept to master. It really comes down to creating the most relevant content for specific user queries and then helping Google bots get a better understanding of your website content, and its relevance to users. Create a detailed sitemap and submit it to Google Search Console. Use structured data markup to clarify the meaning of key topics, terms, and pages. Verify your work with Google’s Structured Data Testing tool. While structured data markup won’t automatically turbocharge your search rankings, it can help you perform better in voice search. It’s also good SEO practice, which Google will reward you for down the line. Considering the recent growth in mobile use and voice search, it wouldn’t be that surprising if one day we all wake up to a world that prioritizes voice-friendly results. When you’re optimizing for voice search, remember that mobile is what matters most. Improve Site Speed – A study from Backlinko found voice search results tend to load 52% faster than the average web page. People expect fast results when they’re on the go, so speeding up your loading speed is good for mobile and voice search. 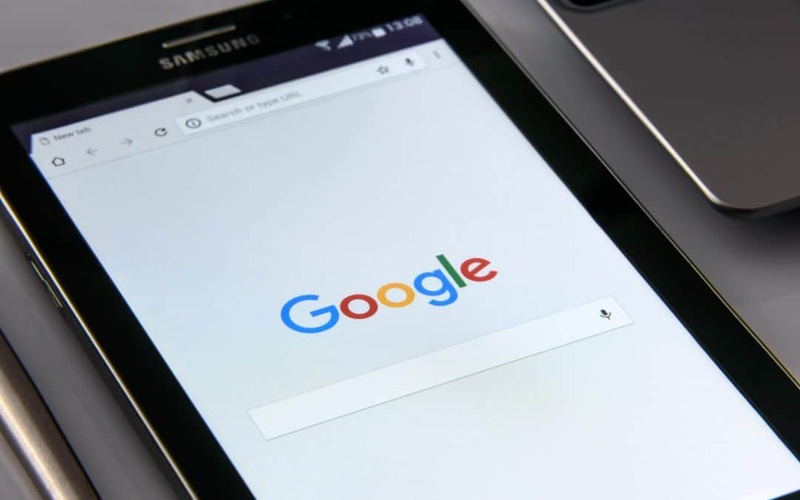 Use AMP & Structured Data – As mentioned, structured data helps align your content with voice search queries, making it easier to summarize for mobile screens. With Accelerated Mobile Pages, it’s likely more of your web pages will get chosen to appear in mobile search results. Optimize for Local Searches – With mobile users being so fond of local-based voice searches, it makes sense to optimize your site content for these people. Look at your business and consider your opening hours, location, products, and promotions. How can you optimize these for local SEO? The first step is to register your business listing on Google My Business. Businesses have been publishing SEO-friendly content for decades. The nature of SEO has evolved drastically over the years, forcing content marketers to adapt and change their methods. And yet, it has remained part of the furniture, a constant rock at that foundation of online business despite all the changes to Google, market spaces, and customer interests. Almost every year, posts declaring “SEO is dead” do the rounds, but it has outlasted many of the bloggers who write such attention-grabbing headlines. SEO is certainly not dead. However, it is a shapeshifter. And now, the unstoppable rise of voice search marketing is disrupting SEO like never before. Because of that, brands have a way of establishing their brand voice in a more genuine, human way. 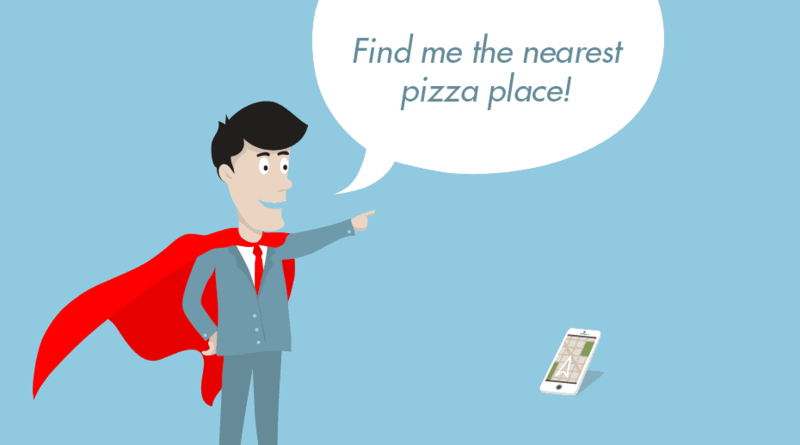 Domino’s Pizza was an early adopter of voice search marketing. The popular fast food chain created a skill on the Amazon Echo in 2017. This allowed anyone to use an Echo or Amazon Dot device to interact with the “personality” of the pizza company – a character called ‘Dom’. Dom responds to user queries in fun ways, adding a fun dynamic while taking people’s orders through voice technology. Your written content may be great, and you may have a foothold in your market for a long time. But can you honestly say you know exactly what your brand sounds like? Content creators are always looking for more effective ways of getting their content in front of more eyeballs. The primary purpose of content is to reach a wider audience, connect with prospective customers, and influence people to support your brand. Voice search is just the latest juggernaut in the game that marketers must consider. There is a growing need for content to give people simple, direct answers, as fast as possible. People want instant gratification, quick wins, and clear answers. Voice search makes all of that possible. Many businesses are lagging behind in this field, some are ignoring it completely. In the same way that the wider aspects of digital transformation cannot be ignored, voice search marketing is developing an inescapable presence, in all manner of industries. Today, it provides your brand with a lesser-trodden path to stand out from the competition. You can use it to really ignite local business or to foster trust with the younger, digital native population who love mobiles and the latest tech. Tomorrow, it may be the bane of your existence, the dividing line that separates you from tearaway market leaders who were just that little bit faster than you to embrace it. Voice commerce sales are expected to exceed $40 billion by the year 2022. The world of business and search marketing is changing as we speak. The time to stake your place is now.